According to the Administration on Aging – as of 2013 - there are 44.7 million persons 65 years or older in the United States, representing 14.1 percent of the population. By 2060, there will be about 98 million older persons, more than doubling the 2013 figure. Locally, in 2014, the Cleveland Department of Aging was accepted into the World Health Organization’s Global Network of Age-Friendly Cities (GNAFC). The following April, Cleveland joined the AARP Network of Age-Friendly Communities. Cleveland is now a part of a growing global movement of cities and communities that are striving to better meet the needs of their older residents by creating urban environments that foster health, active aging, and the well-being of older adults. Founded in 1997, Encore.org is building a movement to tap the skills and experience of those in midlife and beyond to improve communities and the world. Marc Freedman, founder and CEO of Encore.org, an award-winning social innovator, thought leader and author, discusses how to turn one of the most significant demographic shifts of the 21st century into a powerful, positive source of individual and social renewal. 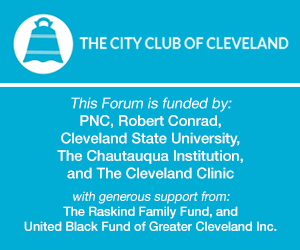 This is the inaugural program in the City Club's Aging in Northeast Ohio series - a conversation with Freedman on making the most of the longevity revolution.